Before she could turn and head toward the surface, a strange, awful thing happened. Tremendous suction suddenly drew her toward the bottom. 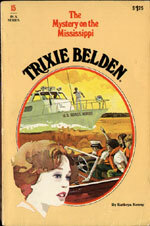 With all her might, Trixie fought, kicking hard against the concrete floor to force herself to the surface of the water. With every thrust, she was caught tighter in the whirling maelstrom that drew her murderously into her vortex. The drain had been opened! Water was flowing with monstrous force through the outlet. Trixie was caught in its spiralling speed! For a brief moment, her head rose above the water. Gasping, she caught a deep breath and screamed in terror. With renewed strength, she slashed the water, kicking desperately and flailing her arms. Using every ounce of strength, she fought her way out of the pull of the water to safety at the pool's edge. There, summoned by her scream, the boys and Honey found her. Huddled around her, they soothed and reassured her. Honey held her dearest friend and soothed her sandy curls. Color returned to Trixie's face. Strength slowly returned to her body. "Somebody tampered with that drain," she said faintly. 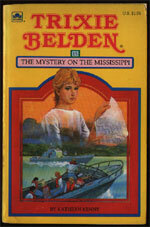 The Mystery on the Mississippi (p. 126). 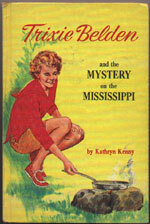 The ghost writer is unknown but could possibly be Stack as she lived in St Louis, Missouri where this book was set. The Bob-Whites take a trip to St Louis on a business trip with Mr Wheeler with thoughts of seeing space ships and re-living the adventures of Huckleberry Finn. But mystery calls when Trixie finds some stranger papers in the waste basket of their room and they are followed everywhere by a mysterious stranger who wants his papers back. The Bob-Whites become involved in a dangerous adventure that sees Trixie almost killed on several occasions and Honey's trusting nature leads them to the most dangerous situation of all. Pierre Lontard alias Diego Martinez was a South American gun smuggler who kidnapped Trixie and Honey and threatened to kill them. Elena and Juan Aguilera were his accomplices. Honey trusted Elena despite Trixie's suspicions, but Elena's compassionate nature may have saved them from certain death. Dan coaches little league baseball, but is able to find a replacement for this trip (p. 15). Di is unable to go as she is away for a month with her parents. Brian and Jim are both seniors (p. 17). So this implies they're about to enter their senior year, although earlier books (#10) suggest that they were in their senior year before the academic year finished. Trixie admits to having premonitions (p. 24). Now her hunches seem to have a supernatural basis! Jim tells Trixie "Don't let Brian and me influence you, Trix" (p. 26). Since when did Brian and Jim want to stop influencing Trixie? Dan is finally given a brain and a role in this book, and he is as suspicious as Trixie and supports her theories. This is really only the second mystery he's been on with Trixie, yet he knows better than Brian, Jim and Mart. Trixie explains the Bob-Whites to Captain Martin (p. 66). For a club that's supposed to be semi-secret, they seem to tell almost everyone they meet and in front of Mrs Aguilera, whom Trixie was instantly suspicious of. 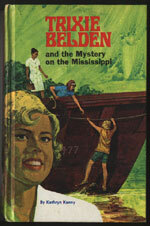 According to Honey, Jim calls Trixie: "Intrepid Trixie" (p. 67). Since when? Dan gets the best lines: "I wish the time would come when you don't know all the answers, Mart" (p. 93). Jim apparently has a speed boat of his own on the Hudson (p. 105). Honey suggests they foster a child with the reward money (p. 233-234).